This week has already been hot with fashion news-Emma Hill leaving Mulberry that she rejuvenated and took to wonderfully new, much desired heights, Jason Wu announced as artistic director for HugoBoss, CEO of sportswear brand LuluLemon leaving with no announcement as yet about who will be replacing her and collaboration between Swedish fashion powerhouse H & M and doyenne of French uber-cool Isabel Marrant. 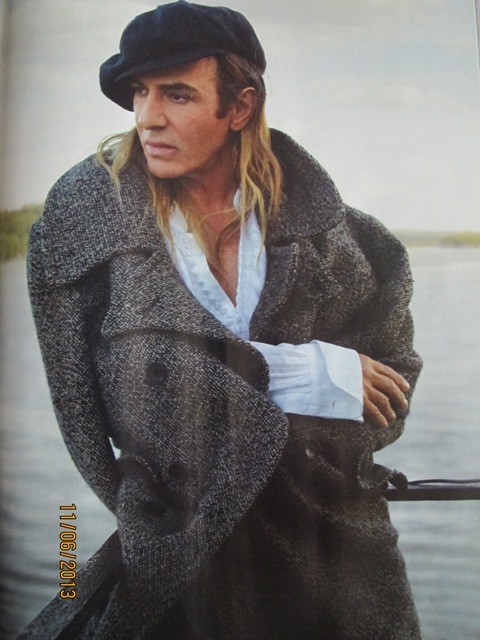 However I was most curious to read John Galliano’s interview in Vanity Fair, his first, after his sacking from Christian Dior and the now notorious cell-video that stopped him and his career in its tracks ( there are now rumours circulating that he is getting ready to do a TV interview as well ). John Galliano always was and always will remain an amazing creative genius who has made a lasting mark on the fashion scene and I sincerely hope that the fashion world will forgive him and will give him the benefit of a doubt, a second chance, that most people deserve. To survive the pressure of too many collections to produce, to please the management and financial big wigs, to entice the clients and to inspire minds isn’t easy and I don’t know how people do it, as every collection needs to be different from anything else you did before. Many designers descend into drug and alcohol fuelled abyss and leave, as their fragile minds cannot cope with the pressures and egos of the people around them, who place personal gains before that of the man or woman who rejuvenates the brand and drives it forward with talent, creativity and vision for the future. I urge you to read the interview that John Gallliano gave to Ingrid Sischy ( who is Jewish by the way and so is Annie Leibovitz, who took sadly poetic and melancholic pictures of Galliano. Neither let her nationality cloud her judgement-Sischy in particular, masterfully allowing the voice of Galliano to strongly come through, so the reader makes up his or her own mind on where they stand on this moral, political and human position and views ). We all make mistakes and its a measure of who we are when it comes down to how we handle lessons learnt-if at all. But it is also telling how people around us react-after all it is so easy to judge others, while being forgiving with yourself. I hope John Galliano’s talent will shine again and he will rise to new heights, like a magical Phoenix-I have heard from friends that he spends a lot of time in Miami and has a solid financial backer behind him, who will hopefully will Mr. Galliano to create and mesmerise fashion crowds around the world. Supposedly all depends on the designer staying clean and sober-at least I have heard that it is one of the conditions. And I certainly appreciate the supportive position of Titans of the fashion industry like Diane von Furstenberg, Oscar De La Renta and publisher Jonathan Newhouse-their views on the subject give me hope that we will be hearing more about John Galliano’s wearable creations. There are unfortunately plenty of people who take pleasure in other people’s troubles and misfortunes and I think it is petty to rally against opportunities for Galliano to try to redeem himself and to find his footing. Fashion inspires and drives us forward, and I hope that one doesn’t have to be a tortured genius to continually inspire people. Beauty is often manifested in the simple things in life, so if we appreciate what we have and move forward with an open heart, things will change and fashion will move upwards, with the help of designers that are rock solid in their talent and ability to balance things without causing offence.